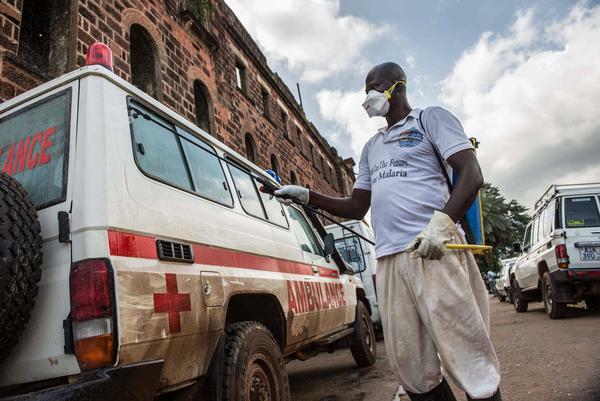 At the main ambulance base in central Freetown, Sierra Leone, a government health worker disinfects ambulances with chlorine spray during the 2014 Ebola outbreak. When Jamil Bangura realized that he and his family had signs of Ebola, in September 2014, he did what he had been told to do. Following instructions from the Sierra Leonean government, he didn't try to treat himself or walk to a clinic. He didn't go to a traditional healer or stay at home. It came — two days later. "I kept calling, and they kept saying, 'Wait, we'll come and take you people,'" recalls Bangura, who now helps lead a chapter of the Sierra Leone Association of Ebola Survivors (SLAES). After the ambulance arrived, the Banguras were kept in the sweltering vehicle for nearly an hour, with no fresh air and no water, while the driver took care of personal errands before depositing them at one of the country's Ebola treatment centers. "It was truly terrible," Bangura says. Sierra Leone's ineffective ambulance system made headlines during the 2014–16 Ebola crisis, which claimed nearly 4,000 lives in the country and more than 11,300 across West Africa. Some patients died in ambulances. Others — suspected of having Ebola but actually sick with something else — may ironically have acquired the virus in overly packed, ill-equipped ambulances. Such horror stories prompted ambulance donations from around the world. Some of the vehicles sent to Sierra Leone were used during the crisis. But in its wake, without a government budget for emergency transport, many have sat idle. Today, a few are used by the country's major referral hospitals and by clinics supported by NGOs. But the majority remain in parking lots across Freetown, the capital city. For many patients in need of emergency transport, it's as if there aren't any ambulances at all. The new National Emergency Medical Service (NEMS) aims to change that. Funded by the World Bank and overseen by the Italian nongovernmental group Doctors with Africa (CUAMM), the service will use 170 donated ambulances and hire about a thousand staff — mostly drivers and paramedics — to start Sierra Leone's first comprehensive national ambulance service. A call center will be staffed by clinicians to ensure that the most urgent calls are given priority and to determine patient needs. Planning for the effort began in January 2018; a pilot of the system is launching this month. NEMS is expected to begin nationally in early 2019. NEMS is based on an ambulance system set up by Doctors with Africa in Pujehun, one of Sierra Leone's poorest and most remote districts. The group provided transport for pregnant mothers and children under age 5 from clinic to hospital — and recorded a three-fold increase in hospital visits from 2015 to 2017. "We knew why patients weren't showing up," says Riccardo Buson, the NEMS director of operations. "Transportation was by far the biggest obstacle." Sierra Leone has one of the world's worst maternal-mortality rates, so the Pujehun ambulance service puts a priority on providing emergency transport for pregnant women. NEMS will maintain this focus on maternal health, with clinics able to call an ambulance for complicated pregnancies. NEMS is primarily meant to be used by health staff referring patients from clinic to hospital, giving special attention to pregnant women. In an effort to have a streamlined referral system in which patients seek care at clinics first, community members are not encouraged to call for an ambulance themselves. "We have to focus on obstetric emergencies," says Buson. "Without more intensive clinical care — fast — there's a greater risk that they or their babies may not survive." There's another reason that pregnant women are targeted: limited resources. While 170 ambulances are more than Sierra Leone had before the Ebola crisis, that number translates into just one ambulance for every 45,000 people. In rural areas like Pujehun, reaching a single patient can take hours. Accessibility is further limited by the country's shoddy roads, which sometimes completely flood during the rainy season, which runs from April through November. But deciding which patients need the ambulance service most is a contentious issue. Dr. Matt Lebbie, the director of hospitals and ambulances at the Ministry of Health and Sanitation, says that NEMS should also transport victims of road accidents. Although there's no reliable data, thousands of wrecks are estimated each year in Sierra Leone, causing hundreds of deaths. The focus on pregnant women also begs the question of what would happen if another viral hemorrhagic fever, like Ebola, were to emerge. The government received significant criticism from its citizens and health staff for restricting ambulances to potential Ebola patients during the outbreak, leaving pregnant women to take private transportation. There are other constraints. With limited funding, NEMS will only run its vehicles 12 hours each day, with the other 12 hours covered by each district's governmental health team. Every district has a threadbare emergency transport system — just a few old vehicles — that had been running on an ad-hoc basis for years before Ebola. Since the crisis, the limited system has remained limited. There's no dedicated funding for these operations, most drivers are volunteers, few vehicles are maintained and fuel is often scarce. "It takes a lot of time to get an ambulance," says a high-level health staffer in Port Loko, a district just north of Freetown, who asked not to be named for fear of losing his job. "No one knows who to call, and there's no dedicated staff around. It can take hours just to get one ready." When I visited Port Loko in July, staff at the district's hospital explained the situation. According to them, the district health team never received funding from the national Ministry of Health and Sanitation, so patients have had to buy their own ambulance fuel — up to 300,000 leones (about $40) per ride. "Patients are buying fuel, or patients just come to the facility by a taxi or a bike," says a health worker who asked to remain anonymous for fear of retribution from hospital management. She collapsed when she arrived. "For me, I knew the clinic wouldn't call an ambulance," says Koroma. "I'm not an emergency. And I didn't want to wait." Koroma's two-week hospital stay cost her 1 million leones (about $130). She now goes back once a week to have her dressing cleaned. Even though she doesn't need an ambulance for these follow-up visits, getting transport isn't easy. She's decided to walk because taking a bike taxi — the most common form of transport in the district — was too uncomfortable. Bai Sheka Wurie, Port Loko's human-resource and transport officer, admits that "we have many problems with the district ambulance system. But those problems are with fuel and staff and maintenance. Will NEMS pay for our extra fuel? Will they let us use their ambulance?" Wurie and his boss, head nurse Hawa Kallon, say they were never consulted by NEMS about the new ambulance system. Nor were they told that each district would likely be responsible for running its night shift. "You don't know the times that people will fall sick," says Kallon, "and we may have more sickness at night than in the day. If we don't have sufficient funds, like those for NEMS, then there will be a huge queue of patients waiting for the NEMS ambulance in the morning." "There's no doubt we should have a national ambulance service," he says. "But you need to think through the feasibility and sustainability. And you need to work with the existing systems." In part because NEMS is funded through short-term donations, planning and daily operations are completely detached from the country's broader public health-care system. As a result, NEMS can't ask for more doctors to be on call when there's a higher patient load or request that more drugs be purchased for hospitals receiving a high number of referrals. Likewise, it can't pay for things that a district health service might be lacking. "It's very fragmented," says Lebbie. Buson knows that an ambulance system that brings more patients to understaffed and underfinanced hospitals "may overwhelm [those facilities]. Maybe they won't be able to support the needs patients have or the number of patients that are sent." The ambulance system is supposed to increase Sierra Leoneans' trust in the health system by helping patients access care. But if already stressed hospitals are further overwhelmed, people might "lose trust in the health system," says Buson. Meanwhile, reports of drug shortages at some hospitals don't help matters. Still, Buson hopes that NEMS will be a big, and illuminating, step toward a stronger overall national health-care system. "The Ministry of Health should see the problems, and then improve on them," he says. "We want to start somewhere, without moving too much around." In the meantime, Buson is working with the World Bank to see if more funds are available to fill some of these gaps. And NEMS and Lebbie are trying to streamline the different services. The first NEMS vehicles hit the road this month — half a year before the national launch in early 2019. But there won't be much time before current World Bank funding for the project expires, in March 2020. While an extension is possible, the long-term plan has always been for Sierra Leone's government to take over. Lebbie says this transition "basically depends on funds." He notes that the health ministry just received the go-ahead from the government to lift a moratorium on hiring new doctors and nurses. "But we don't how we'll afford that," he says. "And now you're talking about absorbing 1,000 drivers and paramedics. I honestly don't know how that will happen." There's also the question of political commitment. NEMS was a key priority for Dr. Abu Bakar Fofanah, the previous health minister (under the All People's Congress), who spearheaded fundraising for the project. The service has not yet been mentioned as a priority by his newly appointed successor, Dr. Alpha Wurie, and the now-governing Sierra Leone People's Party, who are still working out budgets and plans for their five-year term. Ebola survivor Bangura, who has firsthand knowledge of the country's emergency transport problems, wants to see a stronger national ambulance service. But he wants the effort to be part of a stronger overall health-care system. "If people know that there aren't drugs, and that staff aren't around, then they won't call an ambulance," he says. He's also worried about the long-term plan. "Why can't we use the money for NEMS to strengthen the current district ambulance system, rather than creating a new one? Let's stop the gaps we know are there," says Bangura. "This is why we don't see an effective health system in this country," he adds. "We start things, and then they die. As soon as [donor] funding collapses, the system goes. We've learned those lessons during Ebola, and we don't want that anymore in Sierra Leone." Mara Kardas-Nelson, who lived in Sierra Leone from 2015 to 2017, is a freelance journalist currently based in Berkeley, Calif. She reports on health, the environment and global development.